While I wouldn’t say that I’m completely unconcerned about conserving water, it hasn’t been a large focus for me in my desire to simplify our home and practice better stewardship of the earth that God has given us dominion over. I had heard and read bits of information here and there about how to conserve water, but sometimes when you jump into making a lot of changes in life, some of them stick with you more, and others you just pass on by until you’re ready to really go there. I think that as North Americans we tend to expect clean water to always just be there when we want it. I say that because I often live that way myself. We forget that we are incredibly fortunate to live in a part of the world that does have fresh, clean water for us to use daily and we act as though that water will be there forever. Although we are usually advised to limit our water use each summer, I’ve never been in a situation where water shortage became a reality. The issue became much more real to me a couple years ago when we considered a job opportunity for my husband in the suburbs of Atlanta, Georgia. When we began to hear the news stories of the very real water shortage happening in Georgia later that same year, I was suddenly struck by the fact that water shortage is not only a possibility, but perhaps it is more imminent than I thought. “Although water covers about 70% of our planet’s surface, less than one percent of that is safe and available for human use. That one percent must be shared among countries and continents and between the many residential, agricultural, commercial, industrial and envrionmental needs we all have. In the United States alone we demand 26 billion gallons of water every single day. Thirteen percent of that is for residential use, with each person in the country averaging as much as a hundred gallons of water per day. In the shower– 4 to 7 gallons per minute, which means that your 5 min. shower uses 25 gallons of water on average. A 10 minute shower uses an incredible 50 gallons! In the toilet- Anywhere from 3.5 to 7 gallons per flush for a pre-1992 toilet. Newer, low-flow, energy efficient toilets are generally only 1.6 gallons-per-flush (gpf). We have an older home, so let’s suppose our toilet uses 5 gpf and we use it maybe 20 times per day, that’s 100 gallons a day just for the toilet! In the sink– The typical bathroom faucet uses anywhere from 2-6 gallons per minute. In the laundry– A washing machine can use as much as 30-35 gallons per load of wash! I do about 8-10 loads a week (a couple small, but most large loads). That’s 300-400 gallons a week! A friend of mine was babysitting her friend’s son and was reprimanded by him when she flushed his pee-only potty use down. In his home, they practice the phrase “If it’s yellow, let it mellow. If it’s brown, flush it down.” He was quick to inform her (as his mom so often reminds him) that “God gave us that water!” Ouch! But that’s a wise 3 year old (who happens to have a very wise and conscientious mommy)! Edit: Realized I need to explain that we don’t necessarily use this practice in our home, but I think it’s wonderful that a mom is purposefully teaching her children to carefully consider how they use the resources that have been entrusted to them. It looks different for all of us, of course. I want to practice good stewardship in every area of my life, and now that I’ve been further educated, this area should be no exception. I intend to put some of these ideas into practice in the next few weeks and will include my children as I do it, teaching them about why the water that we use matters. Only use the washing machine when you have a full load. If you’re going to wash a smaller load, make sure to adjust the water settings to a lower level. Time your showers and once you’ve established your average shower time, begin to cut it back, one minute at a time until you can do it in 5 minutes or less. Bathe your kids in less water. They’re small and the tub doesn’t need to be more than half full to get those little bodies clean. Purchase Energy Star appliances the next time you’re replacing an appliance, especially for items like the washer or dishwasher, etc. If you’re replacing a toilet, look for one that is low-flow or energy efficient. There are also new dual-flush toilets (yes, a little flush for #1 and a big flush for #2). If you’re stuck with an older toilet, take a water bottle or small milk jug and fill it halfway with pebbles and the rest of the way with water then put the cap on. Open up the back tank on your toilet and put the container into the tank. This displaces the water so that less fills up the tank and less is used with each flush. Always turn the water off when brushing teeth, then just turn it back on for a quick rinse of your brush. Same goes for when you’re washing your face, shaving, etc. Don’t leave the water running while rinsing your dishes. Either use the stopper and put a bit of water in the second half of your sink and do your rinsing in that, or let a few clean dishes build up in the clean sink before you turn on the tap to give them all a quick rinse at one time. Never run your dishwasher when it’s not full. Learn to organize it well so that you can use it as efficiently as possible. More on using your dishwasher well here. Carefully observe the lawn-watering restrictions in summertime and keep your watering minimal. Yes, green grass is nice but letting it dry out a bit isn’t the end of the world. If you must water the lawn, be sure to do it in the morning before the day heats up, or later in the evening once it’s cooled off again. If you garden, try putting buckets out to catch the rainfall and use these for watering your garden instead of the hose. Don’t water except when it’s absolutely necessary (for new seeds, or when the weather has been extremely hot and dry), and mulch to conserve water. These are just some of my suggestions and some from Sara Snow’s Fresh Living. How do you conserve water in your home? And are any of these suggestions something that you think would be feasible for you to do? It’s amazing how many of these suggestions we are already implementing and I don’t even realize it – until now. 😉 Kinda made me feel good, this morning. I am sure there are areas where we can be more conscience of our water – spending habits. .-= Bevy´s last blog ..good ole Mennonite Meal =-. This is all well and good! However, sometimes I don’t understand why bloggers don’t really talk about the freedoms and change in our country over water. Not flushing your pee is quite gross but whatever suits you! I am not trying to be mean…I like your blog but I am tired of all this talk of conservation when we are losing our freedoms and republic quicker than it takes to flush a toilet. Just where I am today….sorry. .-= sandy toe´s last blog ..Thanksgiving Day "Meal" =-. Secondly, that’s just not really the focus of my blog. Though I have strong and passionate opinions on that topic as well, I don’t feel that it’s an area that I have been called to share in. I can understand that you feel it’s important, though. I like your idea of putting the water bottle in the toilet tank! We do use a lot of these suggestions already, but it’s nice to read them again. Thanks! .-= Greta @ Mom Living Healthy´s last blog ..Workout Wednesday: Community Education Classes =-. Great ideas here, and we follow most of them. However, we flush with every use and will continue to do so. It is disgusting when I use the bathroom at a family member’s house with the “if it’s yellow, let it mellow; if it’s brown flush it down” motto. It is always shocking when I first lift the lid and am confronted by that nasty sight, and the smell alone can be overwhelming! I’m guessing the toilet must be cleaned more frequently as well. If you choose to use that method, please consider your guests and flush before they arrive, and while they are visiting. I’ll stick with the water displacement method to conserve water in the toilet. @Jen, I’m not saying that we do this at our house. 🙂 And though I think it’s great for some families, I definitely agree that with guests around, everyone should just flush as normal! A great list! We do many of them here too. I really should put a thing in the back of the toliet though…ours are really old toilets. Also, I should start rinsing my dishes in a sink of water rather than running the tap each time (although I turn it off and on, not running it the entire time). We made a water barrel this year for our garden, but then we kept having to drain it and only got to use it a few times since it rained so much, it filled up and then I didn’t have to use it since it rained so much. LOL! My mom said that she used to put two bricks in their toilet tank to reduce the water usage. For the kidlets, use a big rubbermaid container to bathe them in (the kind you use in the garage for storage). It uses a lot less water and is actually deeper than the tub. Your number 12 about dishes made me laugh…I remember a day not to long ago (ok so maybe it was 9 years ago) when I was shocked at how a certain roommate did her dishes with the water running 🙂 Growing up in California during the drought made me very water conscious, especially because we paid for every drop! And I totally agree with Nola, it really irks me when I see people washing their driveways. I’m amazed at how much bath water my MIL uses for the kids baths… I use about half what she does, I guess I just feel its a waste of water when they’re generally not nasty dirty anyway. We’re on a well so during a drought we could have a very real problem if we were using too much water! thanks for your post, it’s an encouragement that even when you don’t have to you are thinking about these issues. i find conserving water a constant challenge. where we live (Melbourne, Australia) we have ever increasing water restrictions and worry about the amount each household is using. it frustrates me that industry doesn’t seem to be slapped with the same restrictions. sorry my gripe. even when restrictions aren’t high we still aim at reusing water where we can. i keep buckets in the shower and scoop out bath water before pulling the plug and i use this “grey water” on the garden. in our old place we also had a hose connected to the washing machine to take the water out side. we only don’t flush at night and this is mostly because we don’t want to wake everyone up but our toilet also has a half or full flush option. keeping the garden mulched and using water crystals helps the veggie patch. i’m not arrogant in thinking these little changes will save the world but i feel good about focusing my efforts on loving and cherishing this small part of God’s creation. @char, Great attitude, Char! Definitely none of us are going to change the world through our small-scale changes, but we can each do what we can to be faithful in the little that God has given us to steward! -Purchase a high efficiency washing machine. -If you’re a housewife who’s home alone all day, or with just the children, let the toilet go one or two (or three) uses before flushing. You don’t need to inhale, and obviously don’t do this when you have company over. If you’re a well hydrated person, the grey water will not be sitting for long anyway. -Use a low-flow shower head with a shut-off button. Shut the water off while you shampoo, lather, and shave. -Use the “Normal” cycle on your dishwasher. I really never find the need to use the “Heavy Duty” cycle since the dishes always come out clean (even without pre-rinsing and with an older dishwasher). -When running tap or bath water to warm it up, catch the cold/cool water in a bucket or jug and use to water house plants. -Use cooled cooking water from pasta, veggies, and potatoes to water house plants or your garden. -Plant drought tolerant/resistant plants indoors and out. I’m just dittoing several ideas already mentioned, but rain barrels can catch an amazing amount of water off even a small roof for use in the garden. And you can also get a good amount of water from the tap while the shower warms up. We do wait to flush but every 3 times or so if it’s just pee. But I would never do that with guests at our house! My hubby and I lived in a cabin once for 6 months with no running water and it’s amazing how efficient you can be when you have to haul your water in. And it’s also amazing how quickly we can unlearn those habits when water is so available. Thanks for a great reminder. .-= Alisa´s last blog ..It’s finished!! =-. Teaching our family members that they don’t need to put their clothes in the dirty laundry hamper each time they wear them will certainly cut down on the need for doing laundry, and that’s a huge boon for moms of many! .-= Karen´s last blog ..Who Wouldn’t Want a Free Book? =-. We have water tanks on three corners of our house and one on for the barn. We catch our rain water in these 1500 gallon tanks. My husband, a mechanical engineer, made a water filter so that we can use the water for drinking, baking and preserving. We also have hoses attached which allow us to direct overflow into gardens and areas of the property that need water. One of my biggest things is using bath water to water my plants or garden. It is “reusing” the water and the soap can actually help reduce some pests in the garden. But we also put a bucket in the shower for the warm up time and the girls always bathe together. Water conservation was never a priority for me until I was on a mission trip in Mexico. There are cities right on the Rio Grande (which is not much of a rio or grande any more) that have to have water brought in by truck. The idea of having my water brought in by truck really stuck with me. Since then I have tried to be a better steward with the water I have. I cannot thank everyone enough for such wonderful ideas. Really appreciate your attention to this topic Stephanie. Thanks! Great post, Stephanie! I was freshly inspired to look for even more ways to conserve water than our current efforts. We live in Central CA where there are a lot of water issues, and we have to pay for our water, so conservation is a must. My husband set up our washing machine to empty into a large covered trough, which he uses to water our fruit trees. We’re also planning to install foot pedals for our kitchen and bathroom sinks that allows you to turn the water on and off with your foot, so it’s easy to save water while washing dishes, brushing teeth, etc. I’d like Karen and Mr. Karen to help us set up our rainwater collection system! How’d you all make a filter? Getting rain barrels is a goal of ours. Thank you for your thoughtful posts! I haven’t ever posted before, but water is an issue that lays heavy on my heart. After living in an East African village for two years I saw many of my neighbors walk miles for dirty water. They had a special day each week that they would wash their “ndoo” or bucket they would use to fetch the water. We were fortunate that we were able to employ a young man to get our water, but it was still a very stressful issue there. While living there we used most of the tips listed even the “mellowing” method :), but dont worry we didn’t let it mellow long. Thanks for posting about this topic. 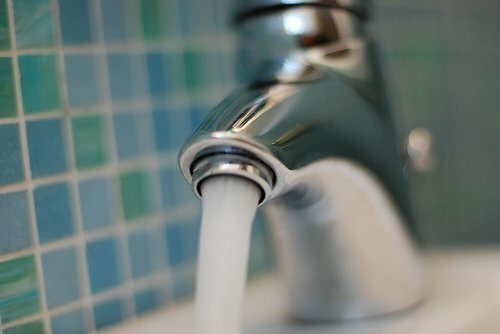 As Americans we consume much more than many other countries, and I think we should work very hard to our best to reduce the amount of water we use. Can i please have permission to use this image for my school work. @tania, The image is not mine, so unfortunately I can’t grant you permission. You would need to credit the image author as I have done. These are all great suggestions! I thought I was the only person who practiced the “shower ever other day” philosophy. During the winter I would “wipe off” (my wife hated that, she was addicted to showering daily) but we did see a difference in the water bills after I started doing that. I’m trying to train my little boy that taking a shower is not play time. I’ve finally gotten him to stop taking toys into the shower. He’s not happy about it but I’m trying to teach him the importance of conserving water. I have also switched over to the more efficient shower heads too. The newer ones have a flow rate of 1.5 gpm. I think my older heads were somewhere around 5 gpm! .-= chris @ Water Saving Showerheads´s last undefined ..Response cached until Thu 25 @ 3:50 GMT (Refreshes in 23.84 Hours) =-.